A report on the current incarnation of the hoary old Café com Leite economic and political movements — a phrase used to describe the ideological dichotomies of the Old Republic of the late XIX Century. (Milk stands for agricultural Minas Gerais while São Paulo still embraces the ways of the fantastic, legendary coffee bubble. The old coffee exchange still stands in the vicinity of Wall and Pearl Streets, I think. I just remember being surprised to come across an almost identical building in the port of Santos, with the same title. Northeastern sugarcane completes the picture and I sigh after taking a cautious slurp. My translation, with minor corrections to preserve the flow. During the second round of elections, (PSDB) will rely on support that far exceeds the numbers of its campaign supporters and militants. 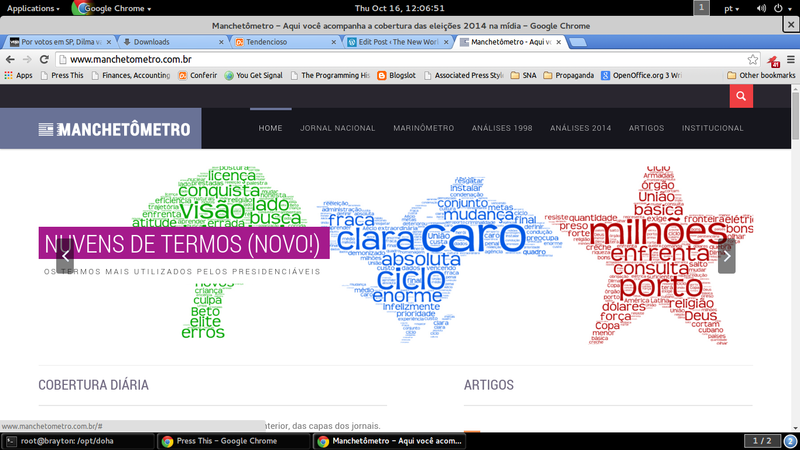 According to the Manchetômetro [Headline Watch], which monitors election media coverage on a daily site, in a typical week has yielded a wealth of stories and articles contrary to reelection of Dilma. The group recently counted 79 negative headlines about Dilma and only 10 (ten) about the center-right Toucan candidate, Neves. 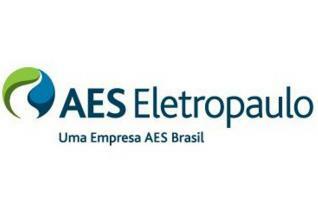 What a coincidence: Here I am reading an article on the business practices of AES Eletropaulo and boom! another transformer explosion like the one that ravaged the motherboard of my other machine — the one that runs on Linux. Windows users, I cannot understand how you can bear it. One of the practices engaged in by most electrical energy distributors in Brazil to increase profits is for different companies to negotiate buy-sell contracts among themselves. Source Valor Econômico | Portal ClippingMP. Brazilian attorneys Leonardo Guimarães and Flávia Godinho compare recent anti-corruption legislation in Brazil with congeners in the U.S. and Britain. Corruption indiscriminately affects citizens, public institutions and private organizations. Brazil as a whole is damaged when corruption distorts the mechanism of the free markets — undermining fair competition, inspiring uncertainty among business owners, and driving away investors. For this reason, combating corruption has been the subject of diverse international conventions, such as the Interamerican Anti-Corruption Convention organized by the OAS and signed in 1996; the OCDE Anti-Bribery Convention, from 1997; and the UN Anti-Corruption Convention, approved in 2005. In response to the various international obligations it assumed, Brazil has passed laws designed to combat corruption, such as the Law of Administrative Impropriety and the “Clean Slate” Law. Brazilian law still suffers from lacunae in its treatment of active corruption by a corporate entity, the only punishment for which is a restriction on the right to enter into contracts with the government. Existing mechanisms must be improved if the new law is not to be just another case of legislative inflation. In the context of adapting our law according to international standards, we now have before us the PLA, the Anti-Corruption Bill (PL 39/13), which will regulate the civil and administrative responsibility of corporate entities for acts injurious to the public administration, both here and abroad. The law was approved in July 2007. From the point of view of comparative jurisprudence, PL 39/13 closely resembles the Foreign Corrupt Practices Act (FCPA), an innovative piece of legislation from the U.S.,in force since 1977, which prohibits the bribing of foreign public officials by U.S. corporations. It bears some resemblance as well with the Bribery Act, passed in 2011, a British anti-corruption law. Although you read that the FCPA is too little used, there are at least two very interesting cases of its application: the Wal-Mart Mexico debacle and the record-setting settlement with SIemens. An April 2012 article in The New York Times reported that a former executive of Walmart de Mexico alleged in September 2005 that Walmart de Mexico had paid bribes to officials throughout Mexico in order to obtain construction permits, that Walmart investigators found credible evidence that Mexican and American laws had been broken, and that Walmart executives in the United States “hushed up” the allegations. According to an article in Bloomberg, Wal-Mart’s “probe of possible bribery in Mexico may prompt executive departures and steep U.S. government fines if it reveals senior managers knew about the payments and didn’t take strong enough action, corporate governance experts said.” Eduardo Bohorquez, the director of Transparencia Mexicana, a “watchdog” group in Mexico, urged the Mexican government to investigate the allegations. Wal-Mart and the US Chamber of Commerce had participated in a campaign to amend FCPA; according to proponents, the changes would clarify the law, while according to opponents, the changes would weaken the law. Siemens, in the Brazilian public eye at the moment, figures in this story, too. In a December 15, 2008 press release, the U.S. Department of Justice (DOJ) revealed the details of a $450 million criminal fine payment made by Siemens AG, a German company, and three of its subsidiaries. The four pleaded guilty of violations related to the Foreign Corrupt Practices Act (FPCA). The three subsidiaries, Siemens S.A. – Argentina; Siemens Bangladesh Limited; and Siemens S.A. – Venezuela pleaded to one-count informations involving conspiracy to violate the anti-bribery and books and records provisions of the FCPA. Clarifying the line between “physical” and “legal” entities — my physical being and my purely notional translation business, say — is an important objective. As in the examples just cited, the provisions of PL 39/13 target the financier of the illegal act and not the receiver of the bribe. This is a completely novel approach with respect to the Brazilian legal system. Within the spectrum of harmful acts that deserve to be repressed we find the defrauding of contract auctions and administrative contracts, as well as promising, offering or delivering, even if indirectly, an undue advantage to a public official or a third party related to that official. In addition, it is forbidden to use an intermediary to hide or simulate the real interests or the identity of the beneficiaries of the act in question, or to hamper the work of agencies, institutions or public servants or intervene in their activity. Administrative sanctions — including the payment of a fine between 0.1% and 20% of gross income for the previous quarter — are applied independently of whether or not the guilt of a corporate entity is proven. I read that paragraph carefully, and that is what it says. I suppose it means that if I cheat at poker in my official capacity as VP of Poker, my cheating reflects on my employer, since it was done in his name, even though without his knowledge. There is a Brazilian legal concept called the domínio do fato that works in a similar manner. It came up frequently during the recent “payola” trial in the Supreme Court, where Zé Dirceu, for example, was not proven to have actively participated in the scheme but who was held responsible for reasons of domínio do fato. Civil sanctions depend on proof of guilt or guilty intent, excepting the loss of assets and sums of money obtained by means of the infraction. It should be emphasized that the fate of the corporate entity does not let the physical person responsible off the hook — this person may be tried separately and/or simultaneously. Also worth mentioning is the rule that provides benefits in the application of sentences for companies that adopt corruption prevention practices, such as “internal mechanisms and procedures to preserve integrity, audit carefully, and provide whistleblower incentives, as well as instilling effective ethical codes for the organization as a whole”. This rule, one of the most beneficial provisions of the bill, stimulates the implementation or updating of “compliance” programs — the Anglo-Saxon term means to act according to a rule. Compliance programs guarantee the adoption of conduct that conforms with the rules and polices, both internal and external, of the company, as well as fostering a transparent ethical atmosphere conductive to corporate best practices. This is a major advance in our legislation, which will now take into account the procedures and internal policies of companies as a way of reducing punishments, as has become commonplace in countries like the U.S. and Great Britain. Observe as well that where there is no regulatory framework to define the pillars of a compliance program, The American guide, A Resource Guide to the U.S. Foreign Corrupt Practices Act (PDF), can be useful. It identifies the “hallmarks” of what are considered to be essential factors in a successful compliance effort. A integridade e os princípios éticos devem estar presentes em todas as ações realizadas pela empresa, incluindo seu relacionamento com o setor público. A possibilidade de uma mudança de cultura a respeito do relacionamento entre o poder público e o particular, com a incorporação de um compromisso das empresas contra a corrupção, é, certamente, uma boa inovação trazida pelo projeto. Embora o projeto de lei, de forma geral, represente um avanço no combate à corrupção, principalmente no que se refere ao incentivo da criação de mecanismos internos de controle nas empresas, deve-se ter em mente as vulnerabilidades processuais e investigativas do nosso sistema, cujas leis anticorrupção anteriores não conduziram aos avanços esperados. A melhor resposta que se possa dar à corrupção, antes da criação de mais um aparato formal, é o aprimoramento e a efetivação dos mecanismos já existentes, para que as novas leis não se transformem em mera inflação legislativa, sem qualquer efetividade. A court in the Isle of Jersey, a European fiscal paradise, has ordered the transfer of one million pounds sterling — some R$ 4.5 million — with ties to the family of federal deputy Paulo Maluf (PP-SP) to the municipal coffers of São Paulo. The funds were released on Friday (May 24) and deposited in the account of a law firm representing the city in London. The money will be returned to the public coffers on May 28, since May 27 is a holiday in Great Britain. 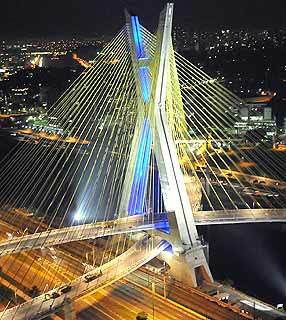 The victory of Fernando Haddad in the recent mayoral elections was bound to produce some high speed 180-degree turns in public policy, I thought. São Paulo – São Paulo mayor Fernando Haddad (PT), announced today — January 23 — that he will transform a judicial order suspending construction on the Nova Luz urban renewal project into a opportunity to rethink the project from a fresh perspective, based on a plan to reoccupy the downtown area with an emphasis on the construction of residences. “I have not seen the legal ruling yet, but certain aspects of the project bother me. For example, delegating to a private agent the decision on which properties will be expropriated. I have never approved this way of delegating urban space,” he said. 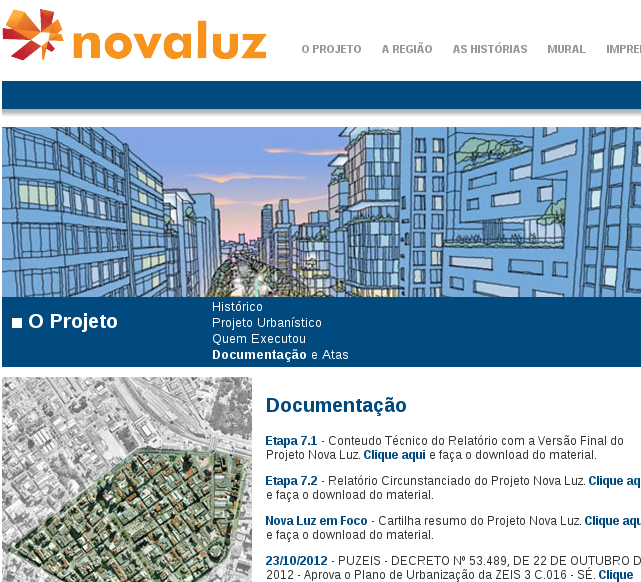 The Nova Luz project was created during the city administration of José Serra (2005-2006) and wound up as one of the main rallying points of his successor, Gilberto Kassab (PSD). It provided for the rezoning of 48 city blocks near the Luz train station by means of an «urban renewal concession» and granted the power of expropriation to private sector contractors. The judge in the case ruled that there had been no popular participation in the drafting of the measure. Haddad’s proposal for the downtown area is to promote the reoccupation of the area by local residents. Yesterday, Haddad and state governor Geraldo Alckmin (PSDB) signed an agreement to develop living spaces in the downtown area. According to Haddad, plans have already been drawn up for the construction of 28,000 residents in the area. “We want São Paulo citizens to reoccupy the downtown area as residents and not just as workers in the area. For every resident, there are five more persons working in the area,” he said. President of the Associação Amo a Luz, Paula Ribas, who has lived in the area for more than 30 years, Haddad’s decision to abandon the Nova Luz projects of his predecessors is excellent news. The Association was the plaintiff in the civil suit that led to the suspension of the project. “We had a meeting to urban development secretary Fernando de Melo Franco in late December, and abandoning the project already seemed to be a prime directive of the new adminstration,”he said. Ribas said the new plan is a good one, but added that City Hall still has to rezone the area, take into account commercial properties, and cope with the region’s social ills, such as crack-addicted street dwellers. A controversial program of forced hospitalization for street addicts is about to be rolled out. 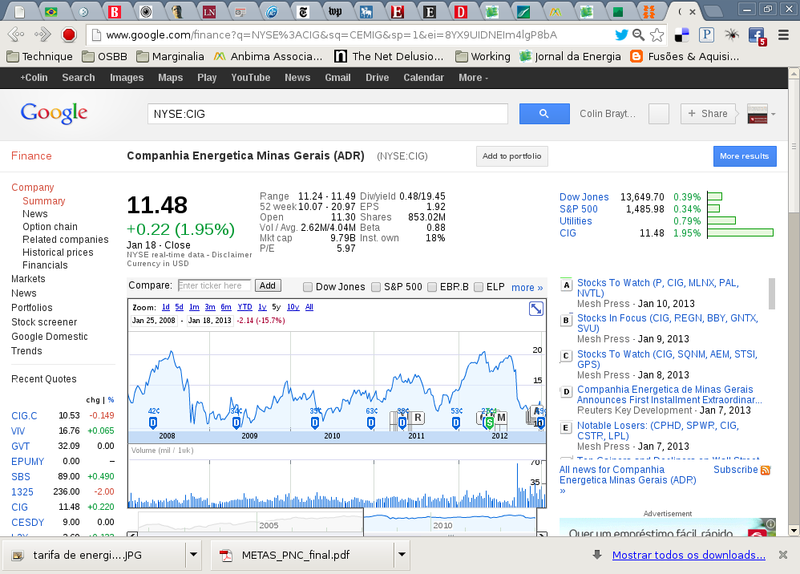 As the date draws near for the early renegotiation of generation, transmission and distribution concessions in the Brazilian electrical sector, Jornal da Energia suggests that major players — including the state-owned Copel and Cesp and the privately owned Tractebel — will fare better in the stock markets than will companies that agreed to the renegotiation. I cannot offer an authoritative translation of the article because I am still trying to catch up on my investor education regarding the ins, outs and bureaucratic tesseracts of the industry. It does seem plausible that the state-owned companies refusing early renegotiation, the aim of which is to reduce electricity retail prices by 20%, represent political alliances acting in concert. Copel, Cesp, and Cemig are all owned and operated governments of the opposition PSDB party. Their combined market share — my half-assed pie chart, above — represents a near-perfect counterweight to the federal Eletrobras. Where is the Cash for Carnaval? In certain Brazilian cities, the theme music for 2013 ought to be the famous Carnaval march “Me dá um dinheiro aí” — Give me some money! — by the brothers Homero, Glauco and Ivan Ferreira. A vintage clip of the marchinha in question is provided, above. Assuming, that is, that Carnaval will be celebrated in those towns. Saddled with debt by previous administrations and tightening their belt accordingly, incoming mayors continue to cut funds allocated to the escolas and the blocos, which has meant the postponement or even the cancellation of traditional celebrations. All because of a budget shortfall.